Want to move your car back into the garage, but have too much stuff in the way. Take a look at the BMS7790 shed, constructed out of durable double-wall resin which is sure to last. The metal truss and ridge beam provide roof support, while the reinforced floor is designed for lawn tractor support. 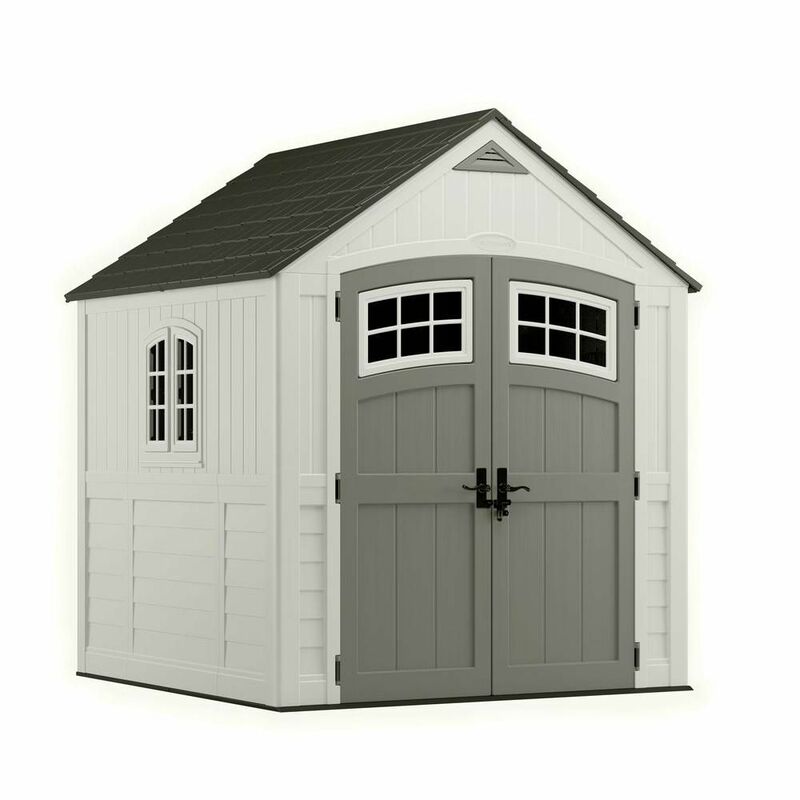 The shed features lockable, metal handles for added strength and security. Additional accessories are available for purchase (not included). The 10 feet x 25feet Utility Shed offer tremendous value and space. The extra large swing-open door opening easily handles storage of large tools and equipment. Makes a great work shop or hobby area! An interior peak height of over 7 feet 7 inches provides added headroom and a large area for organized tool storage. The stylish Duraplus fire retardant vinyl resin plastic shed is a perfect complement to any backyard. It has large entrance doors with a padlock eye handle, side window for light control, 2 vents for air flow and extra large storage for gas grill, snow blower, furniture, garden tools and a sit down mower. It has galvanized steel interior beams, trusses and reinforced steel columns for shelving. It's easy to assemble with step by step instructions. Transform your patio, lawn or garage into a storage magician. This vertical storage shed is like a tall spacious locker, only more attractive and stronger because its crafted of solid wood harvested from the Cypress tree family. Great for storing tools, lawn and gardening supplies, pool accessorieseven sporting equipment. Features double panels for quick, easy access. Pad lockable doors keep items safe from pests and thieves. Protective coating maximizes weather protection. Simple to assemble. Ships anywhere in North America. Cascade 7 ft. 3-inch x 7 ft. 4.5-inch Resin Storage Shed Want to move your car back into the garage, but have too much stuff in the way. Take a look at the BMS7790 shed, constructed out of durable double-wall resin which is sure to last. The metal truss and ridge beam provide roof support, while the reinforced floor is designed for lawn tractor support. The shed features lockable, metal handles for added strength and security. Additional accessories are available for purchase (not included). Cascade 7 ft. 3-inch x 7 ft. 4.5-inch Resin Storage Shed is rated 4.6 out of 5 by 260. Rated 4 out of 5 by Alvin from Nice Resin Storage Shed. Installation was easy. Instructions recommended 2... Nice Resin Storage Shed. Installation was easy. Instructions recommended 2 or more persons, but I was able to fully assemble it without held. Well made, and waterproof. I gave 4 stars because the shipping boxes were not wrapped in plastic in rainy weather and they fell apart in my driveway. Rated 5 out of 5 by SteveC from I did the pre-assembly work (e.g., foundation, doors, windows, roof... I did the pre-assembly work (e.g., foundation, doors, windows, roof truss) in advance. The assembly with one person helping was about 3 hours. Do note that if you install the side window on the opposite side of the plan, then you also need to flip the roof panels. It is very attractive and we experienced nothing too difficult or surprising. Rated 5 out of 5 by Waterlawyer from Highly recommended. I Love the Shed! It’s attractive, sturdy... Highly recommended. I Love the Shed! It’s attractive, sturdy and easy to assemble. Rated 5 out of 5 by KT from Easy to assemble, great looking, and turned out to be... Easy to assemble, great looking, and turned out to be the perfect choice. Rated 3 out of 5 by virgil from shed what is the height at the peak? will it fit under my block wall? my wall is 8'tall. Rated 5 out of 5 by HomeDepotCustomer from Good quality! I recommend having a second person help set... Good quality! I recommend having a second person help set it up. Way easier. Yes it can but you can also assemble the unit in a larger area and push it into the space that you want it because its light enough. Is the roof brown or grey? The roof is dark brown. does it ever go on sale in the Spring months like March, April? What are the shipping dimensions? &nbsp;How many boxes? Do the windows open are are they strictly cosmetic? Could someone please give me the final OUTTER dimensions of the shed assembled. I'm pouring a pad for it to sit on and don't to go too small but I'm tight for space as well. Thanks!! Do you have someone that can come and assemble it for me?